Jenny Doss lives in Cincinnati, Ohio with her husband Bill and two dogs, Angus and Sasha. She is a self-taught artist whose paintings range from abstract to expressionist, but whose primary focus is on pop and folk art. She works in acrylics, watercolors, and mixed media, including clay sculptures, as well as collage and assemblage art. Jenny loves animals, and is constantly creating works that incorporate animal themes, especially that of dogs. Her own two dogs provide endless inspiration for her paintings, as well as the animals of her family, friends, and those she just happens to meet when she's out and about... she's always stopping people and their dogs to say hello! Jenny has sold her works to collectors ranging from California to Rhode Island, as well as overseas to Europe. 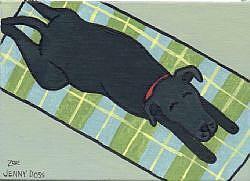 She does commissioned work for collectors, usually of their pets, and has had many happy responses to her art. She has been a member of EBSQ for quite a while, and regularly participates in the online art discussion boards, as well as acting as a mentor for new members. She became a juried member of EBSQ Plus in 2003. Country Music Television's "Most Shocking!" Jenny is currently working on commissioned pet portraits, as well as a new line of art trading cards, dog toys based on characters from her paintings, illustrations for a children's book, monthly online shows, and much more!